Agroforestry systems, in which trees are integrated in arable or pasture land, can be used to enable sustainable food, material, and energy production (i.e. provide provisioning ecosystem services) whilst reducing the negative environmental impacts associated with farming. However, one constraint on the uptake of agroforestry in Europe is a lack of knowledge on how specific agroforestry designs affect productivity. A process-based biophysical model, called Yield-SAFE, was used: (1) to quantify the food, material and biomass energy production of four contrasting case study systems in Europe in a common energy unit (MJ ha−1), and (2) to quantify how tree density determined the supply of provisioning ecosystem services. The Yield-SAFE model was calibrated so that simulated tree and crop growth fitted observed growth data for reference monoculture forestry, pasture, and arable systems. The modelled results showed that including trees in pasture or arable systems increased the overall accumulated energy of the system in comparison with monoculture forestry, pasture, and arable systems, but that the accumulated energy per tree was reduced as tree density increased. The greatest accumulated energy occurred in the highest tree density agroforestry system at all the case study sites. 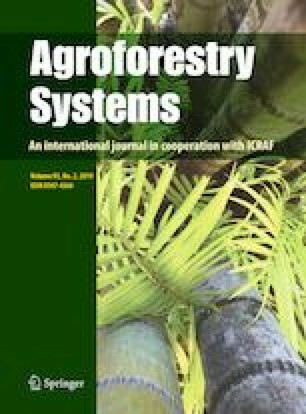 This suggests that the capture of environmental resources, such as light and water, for obtaining provisioning services is most effective in high density agroforestry systems. Further modelling should include tree canopy effects on micro-climatic and the impact this has on pasture, crop, and livestock yields, as well as the impact of tree density on the economic value and management of the different systems. We acknowledge the financial support provided by the Portuguese Foundation for Science and Technology (FCT) through the scholarship (SFRH/BD/52691/2014) and PEST (UID/AGR/00239/2013), and the European Community’s Seventh Framework Programme under Grant Agreement No. 613520 (Project AGFORWARD). We would like also to thank the suggestions from the reviewers, whose comments greatly improve the manuscript. Proportion of leaf area that will fall (1 = deciduous). Is it a short rotation coppice species? Is wood used for materials? Is the crop a tuber?